A Demure white dress made of satin and lace is no longer the criteria for a wedding dress. With every bride wanting to look unique and stand out from the rest, designers are getting more and more creative, pushing the boundaries and creating some truly awe-worthy and sometimes shocking masterpieces. The Short and Flouncy Dress. This short wedding dress proves that you don’t need a floor sweeping wedding dress with a long train to look like a bride. Modern and yet so romantic, this dress is perfect for a bride looking for something different that manages to be graceful as well. The Platinum Dress. When we say platinum we don’t mean a dress that looks like it was made out of platinum; what we mean is that the dress was literally made out of platinum. It is made from fabric spun from silk and platinum, with delicate embroidery and an off-shoulder cut. While dresses made of gold and silver are more common, dresses made of platinum are pretty much unheard of. It can’t get more unique than this, can it? Oh by the way, the price tag is 240,000 pounds. The Sweet Dress. If guests at a wedding mention that the bride looks yummy, do not be alarmed. Instead look closely at the bride’s dress. Made with 2000 sugar-coated rose petals, this wedding gown comes with edible accessories such as a necklace, bracelet, earrings and a bouquet, all edible. The Black is Beautiful Dress. Wedding dresses have to be white right? Sure, if you’re a traditionalist. But if you’re looking to make some waves and push the limits, then the black wedding dress might be perfect for you. Peacock Wedding Dress. Designed by iconic fashion designer Vera Wang, the peacock wedding dress was made out of 2009 real peacock feathers. Priced at around 1.5 million dollars, this dress required eight artisans to work dedicatedly to make sure the feathers were all beautifully stitched and created the perfect train. The Ruffled Ombre Dress. Whimsical and unusual at the same time, this dress makes quite a statement. It features a long train that has a purple ombre effect at the end. This would be a great way to incorporate the wedding colour theme onto the bride’s dress. The Peek-a-boo Dress.This dress is, quite simply put, adorable. At first glance it looks like a normal white wedding dress in a simple cut and style. 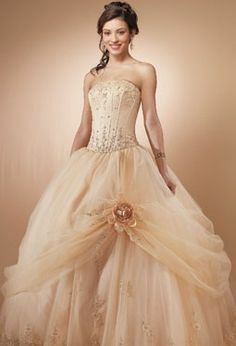 But wait till the bride makes a twirl on the dance floor and you’ll see that there’s nothing ordinary about this dress. With a bright pink underside to it, this dress is fun and stylish and unique; everything a wedding dress ought to be. The Diamonds are Forever Dress. Ranking in number one spot as the world’s most expensive wedding dress is this diamond wedding gown that was a result of a collaboration between jeweller Martin Katz and fashion designer Renee Strauss. Made out of the finest fabrics, the dress contains 150 carats of diamonds. One thing is for sure – the bride who gets to wear this is not going to need any other jewellery to adorn herself with. Just when we thought that we’ve seen it all, designers manage to surprise us with something even more awe-inspiring and unbelievable. We wonder what the future holds as far as unique one-of-a-kind wedding dresses are concerned. For all you know, there might be a rainbow coloured wedding gown made with every precious gem known to mankind in the near future.